Bundaberg Rum‘s Watermark campaign has been recognised with a Silver Integrated Lion and a Gold PR Lion at Cannes International Festival of Creativity. On January 26, 2011, Queensland in Australia was hit by floods so devastating they wiped out 75% of the state. Despite the Bundaberg distillery being flooded the company felt a duty to lift the spirits of Queenslanders as it had done for over 100 years. Two days after the distillery was drained, Bundaberg launched Watermark, a new product designed to rally the nation’s support and help rebuild Queensland’s fighting spirit. Watermark was branded to mark the point where the floodwaters peaked, and to mark the spirit in the towns on the road to recovery. 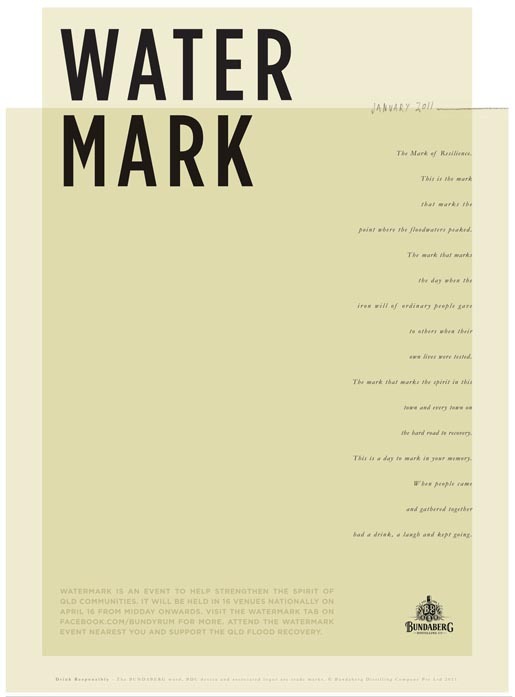 All proceeds from the sales of Watermark went to the flood relief. 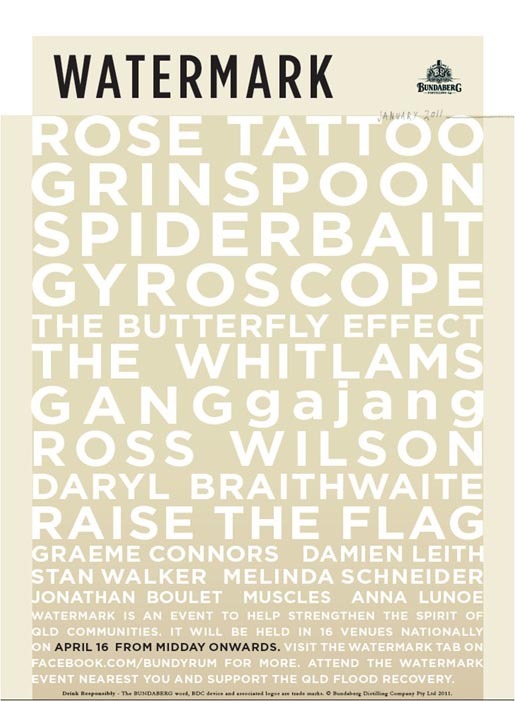 Bundaberg worked with Leo Burnett to promote the Watermark campaign with 16 watermarks and 16 music festivals, beginning by going to the 16 worst hit towns and placing a watermark on the walls of the pubs. Watermark was launched with 16 music festivals in these 16 areas, all kicking off at midday on April 16. Australia’s biggest bands played, which drew the attention of the national press. The spirit then spread through national media and social networks and the nation united behind Watermark. 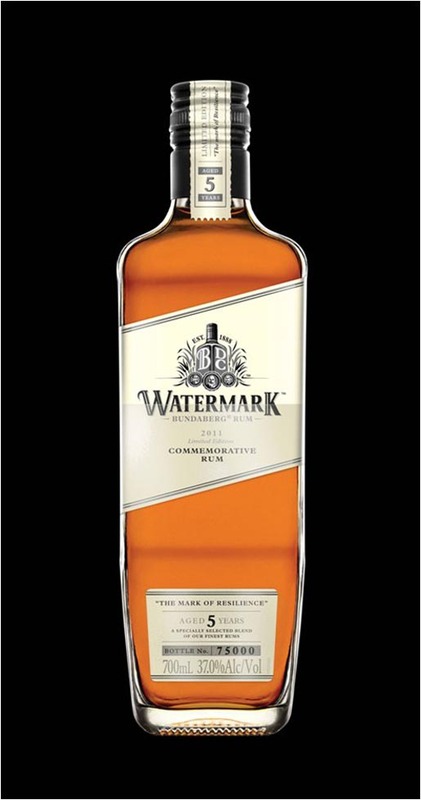 Watermark then went on sale in bottle stores nationwide, online and at the distillery. When Watermark went on sale people queued up for over 96 hours to buy it. The first run of Watermark sold out within a week and a second run went into production. The product and events received a lot of attention in the press and in social media, and the entire nation rallied behind the cause, meaning Watermark played a huge role in lifting Queensland’s spirits and helping the State on the road to recovery. The Watermark campaign was developed at Leo Burnett, Sydney, by executive creative director Andy DiLallo, creative director/art director Tim Green, copywriter Rupert Taylor, designer John-Henry Pajak, planner Warwick Heathwood, head of client service Peter Bosilkovski, account director Jodi McLeod, senior business manager Sam McGown, and account executive Caroline Heslop.